Polonnaruwa is one of the ancient most cities of Sri Lanka that affirms to be a precious jewel in its tourism. Being one of the bests in Sri Lanka since time immemorial Polonnaruwa has witnessed the emergence and decline of several civilizations. Buddhism and of Singhalese history has also been a part of this place. There is a ravishing relic placed in the Atadage which is believed to be the tooth of the Lord Buddha. Polonnaruwa is not just about grand civilizations, fascinating ruins, and glorious history but it is also about the mesmerizing natural essence that the almighty has bestowed. The historical ruins and brahmanic monuments looks just perfect with the bountiful natural backdrop. 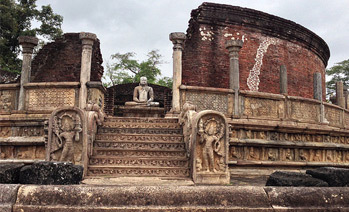 The Lankatilaka: It is a place which comprises the most magnificent structures in Polonnaruwa one of which is an enormous figure of Buddha and has been preserving it since ages. This temple has been designed by Parakramabahu with intricate work of bas-reliefs and secured with 17m-high walls each side. The alluring aisle in the temple leads one of the most remarkable figures of Buddha. The devotion of one’s self doubles up with the fragrance of the incense all around. The Gal Vihara: It is the best place to explore the intricate and most admired Sinhalese art. However, it is yet another place preserving Buddha images which proves the predominance of Buddhism in that time. The best part of this elegant historic place is the gigantic rock sculptures which affirm to be the retreat to one’s eyes. These Buddha images showcase the influence of Sinhalese rock carving. Gal Vihara, as a whole, is an intricately engraved portion of granite which results in four individual figures. The Tivanka Image House: It is built in somewhat similar style of Thuparamaya and the Lankatilaka but is relatively larger than the two. 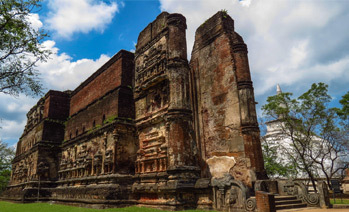 It is listed among the largest brick built shrines of Polonnaruwa comprising the eminent Tivanka image of the Buddha, exclusively designed in the thrice curved pose. It is famed not only for the images but for the mural paintings too that dates back to the 13th century which adorns the image house elegantly. How to reach Polonnaruwa: Sri Lanka is very systematic and well connected therefore there is never a problem in transportation. Polonnaruwa is approximately 216 kilometers from Colombo making it easy to travel. If travelling by car one can explore the lovely rock-cut caves of Dambulla enroute. Besides the trains, there are regular CTB buses (AC /non AC) to and from Colombo every 30 minutes making travelling amazingly easy. Best time to visit Polonnaruwa: The best time to visit this amazingly awesome place of marvels is from October to April.